In this article, we will discuss a tool which helps to automate testing and also with data gathering. The tool is known as LabVIEW, i.e., Laboratory Virtual Instrument Engineering Workbench. It is known as a graphical programming environment which is widely used in research labs, industries, and academics. It is an instrumental software system and a competitive analysis tool used for measurement and automation. The tool is utilized by using a programming language named as “G” (Graphical programming language). Using the graphical programming language, it eliminates the use of text-based/syntax based coding practice. LabVIEW offers more flexibility when compared to the industry standard laboratory instruments because LabVIEW is software based. The data controls can be easily managed when LabVIEW is utilized. Firstly, we will understand what LabView is, and then we will discuss the advantages of using this software tool, and go through the basic workflow of the LabVIEW software. What is the programming language used in LabVIEW? LabVIEW is a programming environment in which you will be able to create programs using graphical notation. A graphical notation is nothing but a process where you will be connecting functional nodes with wires which ultimately depicts how the data flows. Unlike the traditional programming languages like C, C++, or Java, programming is executed in terms of text. LabView is not just a programming environment, it offers much more than a coding platform. It is an interactive program development system which is specifically designed for people like scientists and engineers. 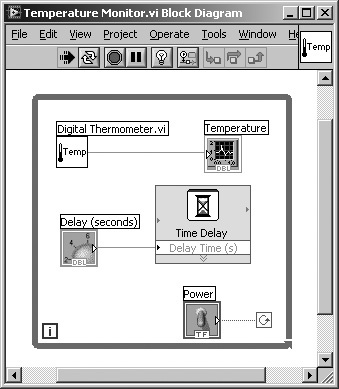 The LabVIEW environment works on computers like Windows, Mac OS X, and Linux. The programs that are created using the LabVIEW environment can be executed on platforms like Microsoft Pocket PC, Palm OS, Digital Signal Processors (DSPs), microprocessors, and Field programmable Gate Arrays (FPGAs). The programming language used in LabVIEW is called as “G”, (G stands for graphical). Usage of LabVIEW increases productivity as it takes considerably less time to develop applications when compared to the traditional programming languages. Using traditional programming languages, it takes about weeks to months accomplishing the development tasks. The same tasks can be completed within less amount of time by using the powerful graphical programming language. In this section, the users will be able to understand the benefits that are associated with LabVIEW. 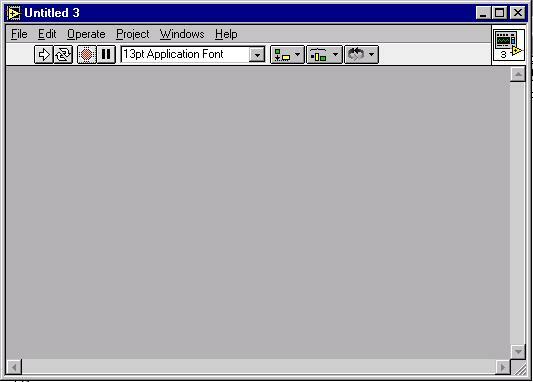 Having a graphical interface makes LabView easy for programming. A user will be able to present how the data flow happens within a virtual instrument. Basic programming concepts can be taught. Completely flexible in terms of creating a virtual instrument according to your requirements. You can easily modify the virtual instruments as and when a change is needed. Has extensive libraries of functions and subroutines. These can be used for programming tasks. Thus, eliminating the fuss of having pointers, memory allocation, and often troubles that occur with a traditional programming language. Contains specific libraries that are related to Data acquisition (DAQ). These libraries are useful for data analysis, data presentation, data storage and ultimately communication. LabVIEW has specific Analysis libraries which have useful functions like signal generation, signal processing, filters, windows, and regression. All these are used for analysis. The output data can be represented in any graphical format, i.e. charts, graphs etc. LabVIEW programs are portable, i.e. you can write a program in Mac and then execute it in Windows Machine and vice-versa. In this section, we will discuss about the programming language that is used in LabVIEW and how the dataflow is represented graphically. The program development efforts related to LabVIEW are different compared to the standard development, which is nothing but text-based programming where developers use predefined text syntax. When it comes to LabVIEW programming, the coding is carried out using a graphical programming language, which is often called “G”. 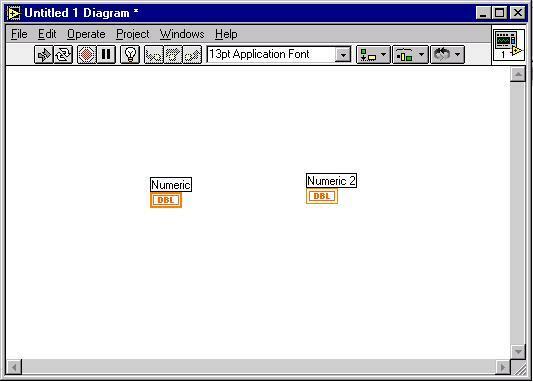 Using this language, programs are created using pictorial forms which in turn are called “Block Diagrams”. Using a graphical programming language, the developers will be able to achieve the tasks in short duration of time, and at the same time doesn’t have to bother about adding semicolons, curly braces, etc. With the use of graphical programming, the developers will be able to focus on the data flow within the application. In the below screenshot, you will be able to see graphical interface of LabVIEW. In the above screenshot, the user will be able to see the Graphical code. The graphical programming helps the users to understand the data flow within the application. The below screenshot is just an example which depicts the data flow. In this section, we will discuss the main differences that LabVIEW tool has compared to the traditional tools. LabVIEW uses the graphical representation of all icons which are easy to understand by scientists and engineers. So, the entire tool relies on the idea of graphical representation rather than a text-based approach. The execution is completed based on the data flow. So, the process execution will only be initiated after the relevant data is received. Using the graphical approach, the users will be able to use LabVIEW tool without much knowledge of programming language. If you have a programming/development background, then the concepts will definitely help you to understand better. In this section of the article, we will try to understand the components that are available within a virtual instrument. 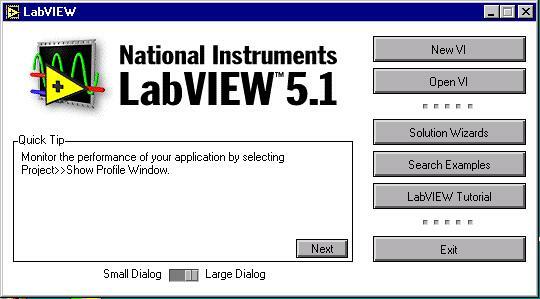 The LabVIEW program consists of a single or multiple virtual instruments, which are commonly abbreviated as (VI’s). It is pronounced as “Vee eye”. Let us understand about these three components in detail and also explore the tool controls/ options further in the article. When the user clicks on the LabVIEW start button, a screen will appear with few options. You will get to see two options, i.e. “Create VI” and “Open VI”. VI”s are nothing but virtual instruments which are programs that are created in LabVIEW software. Selecting “Create VI” will create a new virtual instrument. Selecting “Open VI” will give an option to view an existing VI. This is nothing but a Front Panel screen. A front panel is nothing but the interactive interface for the user. It displays the entire panel where the users will be able to select different options and execute the process. Further, the front panel has push buttons, graphs, knobs, indicators, and other options. The data can be keyed in by using a mouse or keyboard. The results can be viewed on the screen. While creating a new program, the user will have to decide the inputs and outputs which will be available. Then, place the cursor on the gray area in the front panel and right click. A new window will appear, i.e. Control window will popup. 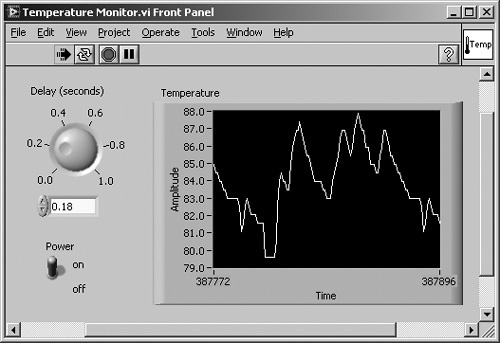 A screenshot is displayed below, showing controls window on the front panel. Within the controls window, a lot of options are available. Some of them are numeric control menu, graphs, arrays, boolean, and other sets of controls. For this instance, let us go with numeric control. So, from the control’s window, select “numeric control menu”. Now, place the controller anywhere on the control panel. Now, select “Digital Indicator” from the control’s window and place it on the front panel. The same is depicted in the below screenshot. 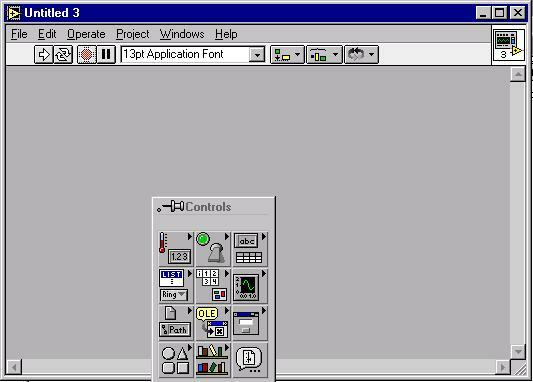 These two controls can be used while you create a program. The next steps are explained below under Block Diagram section, which is nothing but our next component. This is the second component within the Virtual Instrument. This is an important area where the underlying code goes into the program. Using the inputs and outputs, the program is created graphically. The users will be able to select “objects” from the functions window. A block diagram is nothing but VI’s source code. It is actually programmed in using LabVIEW’s programming language, i.e. “G”. It is the actual executable program. The block diagram’s components are lower level VI’s, constants, program executable control structures, built-in functions. The user will be able to draw wires and connect with the objects and define the data flow. For example, the below screenshot displays a block diagram. In the block diagram stage, the user will be able to see two menus. Out of which, the first menu option is “Tools” and the second menu option is “Function”. The below screenshot displays the options that the users will be able to access under “Tools” menu. If you closely observe the below screenshot, the user will be able to access different tool options that are available within the menu. The tools menu will offer the user different options and functions. For example, in one scenario the cursor is used to change the values, in another scenario, the cursor is used for changing the size and move items. Also, to understand the different options that are available within the “Tools” menu, then simply, the user has to hover the mouse to a specific option and it will display a description or help text for that option. The next menu item is “Function”. This menu option is only available when the user is working on “Block Diagram”. The below screenshot displays the options that are available within the “Functions” menu. This menu has a lot of options and sub-options. To understand the available options, you can simply hover your mouse and a description or help text of the option is displayed. The next important component the user has to understand is “icon”. This component is essential for the users to use a VI as a subroutine in another block diagram of another VI. For this to happen, it needs an “icon”. A VI that is in the above case is called as “SubVI”. The below picture depicts an icon where few inputs are connected to an icon which in return can be connected to another new level, i.e., another VI in this case. Virtual instruments, i.e., VI’s are modular and have a hierarchy approach. They can be used within top-level programs or subprograms. So, to consolidate, LabVIEW promotes modular programming. The entire application is divided into a series of subtasks and for each subtask, the user can have a VI. While executing the application, all the VI’s are processed and clubbed together so that the entire application is executed. Using the above approach, the users will be able to set breakpoints and debug the flow to identify any known issues. In this section of the article, we will discuss the common terminology that we use in conventional languages and compare it with LabVIEW terminology. G C, C++, Java, Basics etc. Error handling process is very important in any software development activity. Most of the softwares do provide an option for the developers to debug their code and identify the glitches. In the same way, LabVIEW has also accommodated error handling process or techniques. If there is an error identified in one of the SubVI then all of the subsequent SubVIs will not be processed or executed. Within the Error clusters, all the error handling conditions will be added to it and all the errors are automatically handled based on the conditions defined. So within an error cluster, the developers will have an option to determine how a subVI is executed, especially when an error is encountered. Using the error cluster controls and indicators, the developer can identify the error inputs and error output within a SubVI. The following components are available within error inputs and error outputs of a SubVI. Status: This is nothing but a Boolean value which represents TRUE if you have encountered errors. Code: This is a 32-bit signed integer that is used to identify the error numerically. Source: This is a string which helps to identify the place where the error has occurred. In this section of the article, we will discuss the existing examples that are available within LabVIEW and understand the process of identifying the LabVIEW examples. In most of the LabVIEW projects, the developers can find a working example and can customize according to their needs. This feature is definitely a good option for developers who are new to LabVIEW and gives a provision for them to quickly learn and also utilize the tool in an effective manner. With the use of NI Example Finder, the developers will be able to search for examples that are installed on their computers. The following screenshot shows how a developer can actually look for existing examples. The main use of these LabVIEW examples is to determine how LabVIEW can be used to perform a wide variety of tests including measurement, control, and design tasks. Click on Find Examples or Launch NI Example Finder. Using this option, the user will be able to see through the list of LabVIEW examples. 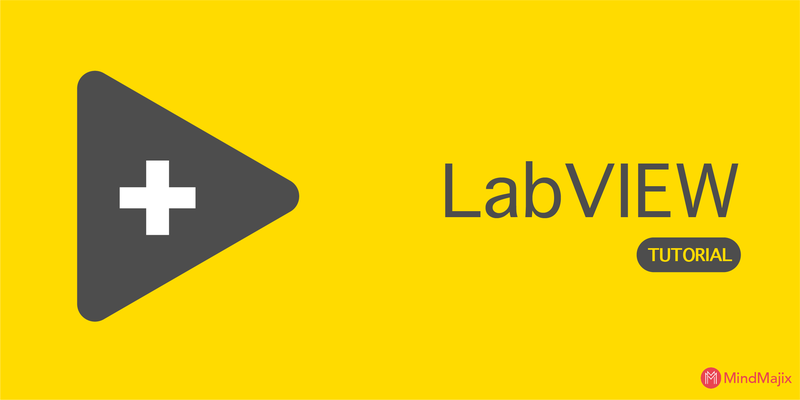 Double click on a specific LabVIEW example will give you more details about the VI. Looking at the VI, the developer can actually customize according to their needs and work accordingly. This will save time and it is really beneficial for the developers who are new to the tool. LabVIEW is a niche software where most of the companies have invested their time and energy to increase the overall productivity of the organization. 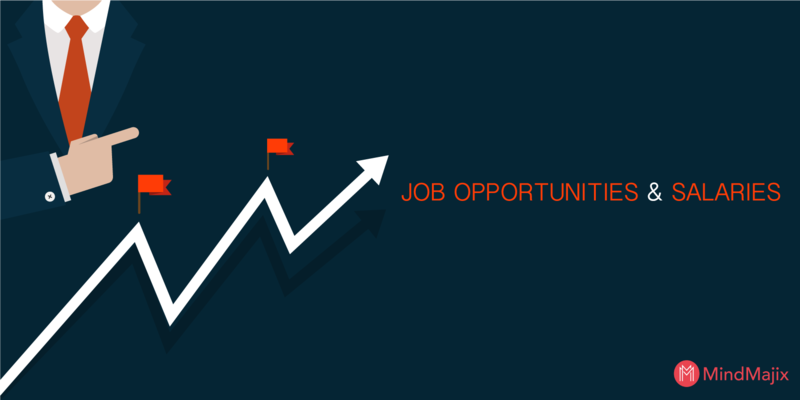 There are a lot of job opportunities that are available in the current market where organizations do pay hefty salaries for experienced professionals in this area. There are ample amount of opportunities all over the world for LabVIEW developers, and depending upon their experience and exposure towards the tool, the salary will vary. Typically, the salaries for LabVIEW developers start from $ 60k to $ 103K. The variation of the salaries completely depends upon the factors like employment location, company, and the experience of the individual. LabVIEW is a powerful tool where most of the organizations who are into Industrial Automation, Engineering, Research & Development use this software to build prototypes and proof of concepts before building the final product. A lot of Startups are actually using this software to build complex systems as it reduces the amount of development effort in total. Also, the use of LabVIEW software is predominant in the areas where hardware products are built based on embedded programming languages. The demand for LabVIEW developers has always been high in the current market. Most of the companies are providing solutions in terms of Industrial automation and household automation. To support this movement, the organizations have to definitely use LabVIEW effectively. The demand for LabVIEW developers will be predominant even in the coming years. With the use of conventional programming languages, the users can still automate the testing and also manage the data gathering, but the number of efforts that are put in to deliver this also high when compared to LabVIEW. Using its user interface and graphical programming language, the execution can be achieved in a shorter duration of time without affecting the quality and productivity. Using this powerful tool will definitely help users to intelligently handle their data processing and data presentation.